On Oct. 26, 2017 the Wilfrid Laurier University Faculty Association (WLUFA) held a solidarity screening in support of Conestoga College faculty who are currently on strike. Faculty at 24 public colleges in Ontario have now been on strike since Oct. 16. There are no scheduled talks between the two bargaining parties as of yet. The event was held in conjunction with Fair Employment Week, which took place at Laurier and all across Ontario last week. Michele Kramer, president of WLUFA, said that there were various scheduled activities which took place at Laurier for the Ontario-wide week. Activities included promoting fair employment in Ontario, some involved the 15 and Fairness campaign, others worked to gain signatures to improve Bill 148, and more. The screening, which took place on the Thursday evening of Fair Employment Week, included a showing of the documentary, ‘Contract Faculty: Injustice in the University,’ made by two Laurier faculty; Garry Potter and Stephen Svenson. Kramer explained that the planned event provided a unique opportunity to offer solidarity and stand with Conestoga College faculty. “If you’re focusing for an entire week [on] practices of fair employment, it completely made sense that we should focus on something that’s happening right here almost right next to us right now, and that was the college strike,” Kramer said. Faculty from Conestoga College partaking in the strike were invited to the screening in order to boost morale. WLUFA also presented a cheque to the faculty’s strike fund. While it wouldn’t mean that university contract faculty would receive the same things if college faculty were to come out successful in their efforts, it would open up important conversations in order to work towards providing university contract faculty with the same rights. Approximately 150 individuals were in attendance at the screening, which included Ontario Public Service Emplyees Union faculty and councilors, as well as various Laurier faculty and staff. In addition to the screening, Kramer explained, Laurier faculty in attendance were able to speak to the similar struggles which contract faculty at the university are facing. 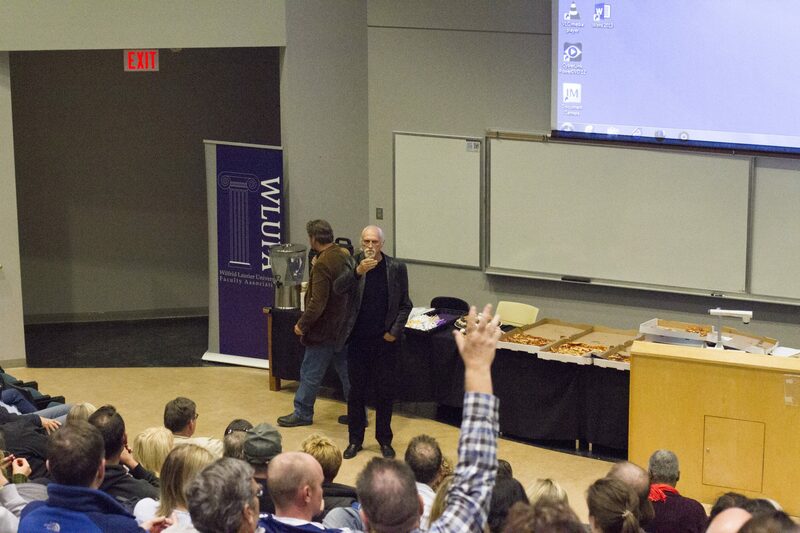 “Many faculty and councilors in the audience on Thursday night were shocked in some cases to find similar issues facing their colleagues in the Ontario college system, that they see happening in Ontario universities,” Herbert Pimlott, associate professor of communication studies at Laurier and vice-president: external for WLUFA, said. Kramer explained that if this large group of college faculty can make an advancement towards equal pay for work of equal value, along with having a more significant say in their college governance system, it may pave an easier path for university contract faculty to make similar advancements. As well, since each university negotiates such aspects on their own, in contrast to bargaining as a massive group across the province similar to the college faculty, it is more difficult to make such significant impact. “The college faculty have the advantage of being a huge province wide group and I think they have, hopefully, a better chance of actually making some gains,” Kramer said. “It’s not just about pay, there are rights involved, et cetera. But it’s very helpful to have this big group fighting for these things,” Kramer said.